CATRICE extends their range of foundation shades for greater inclusivity! Innovative, high-quality products that are inspired by the latest trends from catwalks around the world, CATRICE’s makeup ranges always strive for greater range of applications, richer pigmentation and extended variety. We are thrilled to introduce the latest foundation extensions available in Bronze Beige, Toffee Beige, Chestnut Beige and decadent Espresso Beige. The foundation’s soft and ultra-light feel to the skin creates a perfect complexion that lasts up to 24 hours. In addition to this, CATRICE takes pride in increasing their efforts toward social responsibility and are proud to say that these luxurious, rich foundations are 100% vegan! Get yours for only R144.95 at Dis-Chem, Zando and Takealot. 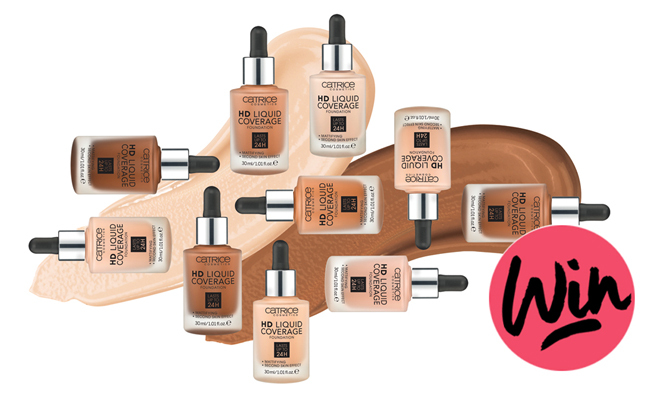 Four lucky readers will each win a CATRICE makeup hamper worth R500! Simply complete the form below to stand a chance at winning. This competition is open to SA residents only and closes at 17:00 on 27 November 2018. You may enter as many times as you wish if you would like to increase your chances of winning. The winners will be drawn from all the correct entrants and notified via email. This prize cannot be exchanged for cash. BeautySouthAfrica.com’s decision is final and no correspondence will be entered into. We will not share your information with any third parties. If winners do not respond to email notification within three days, another winner will be drawn. BeautySouthAfrica.com will supply all hampers to the delivery company in good order, but will not be held liable for the condition of hampers arriving at the winners’ chosen delivery address. Please allow six to eight weeks for delivery. If you have won a prize on BeautySouthAfrica.com in the last two months, you are ineligible to win this competition.